Sheryl McCollum is seen frequently on the major news networks CNN and HLN giving her expert analysis of high-profile crimes making headlines. 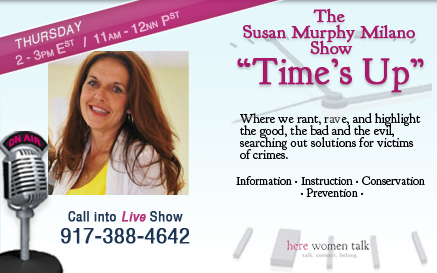 Sheryl and Susan will be discussing the events surrounding the case of missing mother, Susan Cox Powell, whose case was catapulted back into the headlines when her husband, Josh Powell, recently blew up his house with himself and Susan’s two small boys inside. Susan Cox Powell went missing on a cold night in December, 2009 and is still missing and presumed murdered. They will also talk about other cases of intimate partner violence and homicide such as missing mother from Orlando, FL, Michelle Parker and others whose cases have gone cold. As the Director of Cold Case Investigative Research Institute, Sheryl McCollum and her student team have investigated several high-profile cases such as Natalee Holloway, Tupac Shakur, and The Boston Strangler. They also worked on the 2001 murder case of Chandra Levy in Washington, DC and received a visit from Chandra’s mother Susan Levy, a highlight for them. With over 25 years of experience and education, Sheryl is currently the Director of the Cold Case Investigative Research Institute, which is a collaboration between Auburn University Montgomery, Faulkner University and Bauder College. This collaboration brings together researchers, practitioners, students and the criminal justice community to develop new capabilities and work collectively to advance research, training and techniques in solving cold cases. The objectives of CCIRI are to provide the means, resources and guidance for Criminal Justice students throughout all Kaplan Higher Education to determine the solvability of actual unsolved crimes. Sheryl McCollum is the co-author along with Betsy Ramsey of the book COLD CASE, PATHWAYS TO JUSTICE. I have a cold case from 2000 that I was personally involved in. It has changed me and my life. Not for the better. I am looking for anyone who will try to help with this case as Mississippi no longer has a cold case department due to financial funding. Thank you for your time.